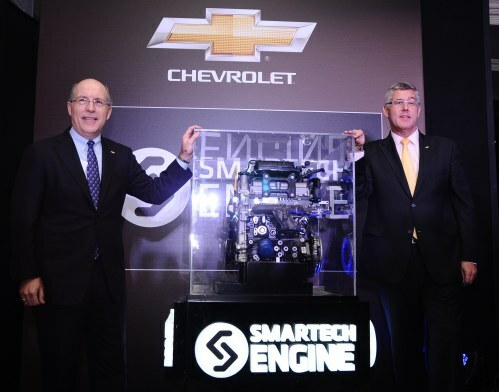 According to the GM news release out of New Delhi, the 1.2 litre Smart-Tech engine delivers uncompromised power and durability in a small package size. Extensive testing and validation were carried out in India to guarantee top-of-the-line performance in all vehicle models that will adopt the engine. Fact is, General Motors has completed 14 years of operation in India. Chevrolet, for example, was introduced in 2003, and is one of the fastest-growing vehicle brands in India. GM India’s state-of-the-art manufacturing facilities in Halol, Gujarat, and Talegaon, Maharashtra, build the Chevrolet Captiva, Chevrolet Optra, Chevrolet Cruze, Chevrolet Aveo, Chevrolet Aveo U-VA, Chevrolet Spark, Chevrolet Beat and Chevrolet Tavera for sale across India. Chevrolet is celebrating its global centenary in 2011. The Smart-Tech engine features aluminum cylinder heads, deep skirt cylinder block and lightweight pistons with low tension rings, which decreases weight and maximizes fuel economy. The engine also features a DOHC valvetrain with direct acting valve actuation to further improve the efficiency, a long runner plastic intake manifold for good low-end torque and lightweight counterbalanced crank shaft for great NVH. The engine has a maintenance-free inverted tooth timing chain drive system. The chain links engage at a lower impact speed, which decreases the noise generated for quiet operation.